Marais' music represents for many the pinnacle of the French viol literature, and the facsimile reproductions of his five books are widely distributed among gambists. 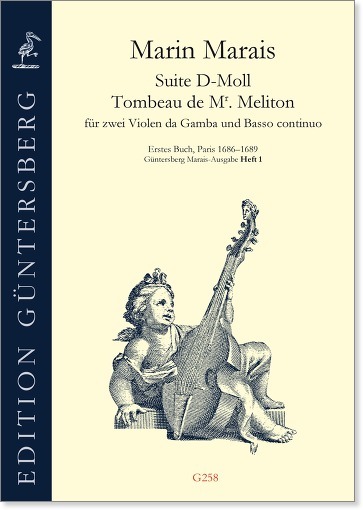 For all those who prefer not to play from facsimiles, Edition Güntersberg has issued the suites for two viols from the First Book in modern practical editions. 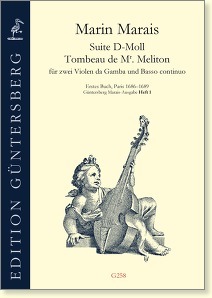 Besides the three part books our editions contain a score, which serves for a better orientation of the continuo players. In addition, for harpsichord players who want to get used to this music we provide a second score, which contains a thoroughly conceived continuo realization. Our viol parts show all performance instructions of the original and are structured in such a way that players as far as possible need not turn pages within movements. The editions contain an instructive introduction in German, English and French.